These colorful fish come in upper and lowercase letters and numbers. Kids love to role play and use their imagination. 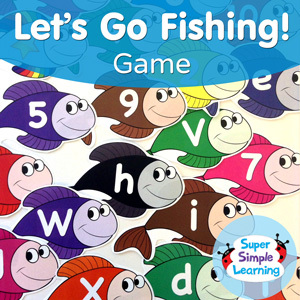 Here’s a fun and easy way to learn or review letters, numbers, and colors by going fishing! Not only can kids practice motor skills by guiding the fishing line to the mouth of the fish to pick it up, each colored fish has a letter or number on it. You can use these versatile teaching tools in many ways, here are a few suggestions. Cut out the fish and attach a paper clip near the mouth of each fish. If possible, laminate the fish so they will last a long time. Make a “fishing pole” for each student in the class using a magnet, a piece of string or yarn 10-15 inches (30-40 cm) long, and a wooden dowel. Tie and/or tape one end of the string to the end of the dowel and the other end of the string to the magnet. Choose the letters/numbers you would like to practice or review and spread the fish on the floor. Make a “pond” by putting rope or a hula hoop around them. Give each student a fishing pole. Make sure the students are careful with the poles and don’t swing them around! Ask the students, “What word starts with A?” Repeat for all of the letters. When you have caught all of the fish, review one more time as you clean up. Call out different letters and have the students give you the fish featuring those letters. (“A, please! Where is your A?”) The students should name the letters as they hand them back to you. For this review game, use a complete set of 26 fish. Turn the fish over (letter side down) and have students catch one fish each. Then go around the circle and have each student tell the rest of the class what letter they caught. For even more fun, add the “star” fish to the pond. The student who gets this fish says their favorite letter, wins a sticker, becomes teacher’s helper for the day, etc. Prepare a set of fish for each student with the numbers you want to practice. After, practice counting and number recognition by putting all of the fish in numerical order. Select a variety of fish that you want to practice. Mix them up and place them face up on the floor. Tell the students to catch a fish of a certain color. “Everyone catch a blue fish!” Students then tell the rest of the class what letter or number they’ve caught. Call out the next color. It can be time consuming to create enough copies of all of the fish for a large class. Break it up by using this fishing game as a review after every six letters. In this case, you only need to cut out six fish at a time for each student in your class. For the next review, cut out the next set of six fish. By the end of the year, you will have multiple sets which you can use again and again. If your magnets are too strong, they may pull the paper clips off the fish. Solve this problem taping the paper clips to the fish to keep them attached. Do you have more ideas for ways to use these fish? Please share in the comments below.